The mother came to the milk program looking for help because her milk was not satisfying the babies; they were losing weight and crying all of the time. Since joining the milk program and ensuring the babies each get adequate amounts of milk, the twins have gone from being below 10% for their birth weight to above 50% for their birth weight! Their lives are a miracle! 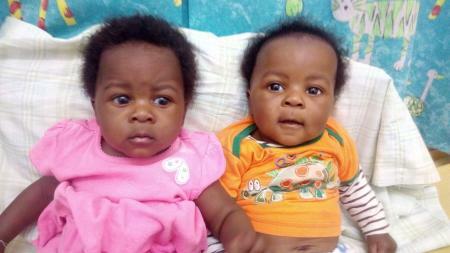 We thank you for making a difference in the lives of our babies here in Mozambique. We strongly believe that God in His wisdom created family. Poverty is never a reason to separate children from their family. For this reason, every 2 weeks, 70 families receive a box of food to fill basic needs. This box does not provide for all of the family’s needs but gets them over the ‘hump’. Many families have kept their children in their homes rather than insisting that the children are taken into live at the centre. It is amazing how such a small box can bring such big help. The youth on base are encouraged to be involved in putting the boxes together and praying with the moms or family members who pick the box up from the pastor’s office on base.